Asiatic Society Kolkata: (Left to Right) Prof. Dr. Samaresh Bandyopadhyaya, Principal Advisor, NIOS; Prof. Isha Mahammad, President, Asiatic Society; H.H. Hanumatpresaka Swami, Scholar, NIOS; Dr. Satyabrata Chakrabarti, General Secretary, Asiatic Society. Swami Hanumatpresaka (Professor H. H. Robinson) represented NIOS on a tour of India and Australia from 26th September to 11th November. This included lectures at the Asiatic Society in Kolkata, interview with Dr. Kalyana-kumar Chakravarti, former head of India’s fine arts, Lalita-kala Academy, and programs at the powerful ISKCON centers in Pune, India and Melbourne, Brisbane and New Govardhana, Australia, also detailed work with the Institute’s Principal Advisor, Professor Dr. Samaresh Bandyopadhyay on upcoming publications, and the Regional Institute of Medical Sciences in Imphal, Manipur. Tour took off from NIOS’s offices in Murfreesboro, Tennessee at 5.30AM and trundled through the fields and hamlets of Tennessee, and through the skies of North America to arrive at the ISKCON Center in Houston, Texas. The campus and community is under continuous development with a two story tall altar, six story classical Vedic temple, pioneer primary school and residential and guest accommodations of over two hundred local community members. Two days later our intrepid explorer flew from Houston to Paris and then New Delhi. Of course, there are many details of dialogs, meetings and work along the way but here we will just touch on some of the highlights. From Delhi he visited the ancient and lectured, sacred, land of Vrindavana. Then about two hours were spent with Dr. Kalyan-kumar Chakravarty, former Director of Education for India’s Madhya-pradesha State, the Indian Institute for Educational Development and the national fine arts, Lalita-kala Academy. The result of the excellent discussions with Dr. Chakravarty and other scholars from O. P. Jindal University and ABES Institute of Technology was a 15-minute video interview on Art and the Sacred. This has been forwarded to NIOS’s very decorated collaborator in Peru, Director Oscar Natars, Integro, and will be enhanced with other interviews to form the basis for promotional video for the Institute’s events in Peru in March and October. Back in the aluminum sausage with the fortunate association of Swami Badri-narayana who was headed for the ISKCON Governing Body Commission meetings in Ujjain, India. 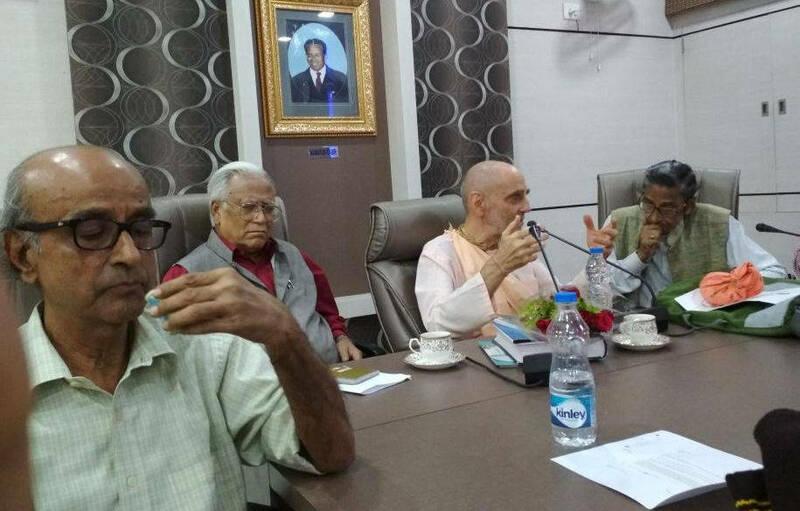 In Ujjain there were three intense days of meetings with members of the Executive Committee of the ISKCON Ministry of Education designing forthcoming events and the Ministries magazine, Viplavah. ISKCON has over 250,000 school age children now and of course NIOS is very happy to try to serve this very classically oriented Society. From Ujjain to ISKCON Pune which like so many ISKCON centers in India is breath taking. The Temple campus has grown into what has been described as the Crown Jewel of Pune. The classical Indian architecture, the daily educational and religious programs, gardens, have attracted developers so that it is now surrounded by high rise apartment buildings filled with residents or under construction. H.P. Swami had very intense meetings about NIOS’ cooperation for developing educational programs world-wide for the Indian classical literature such as Sanskrita Bhagavad-gita and the Bhagavata-puranas. Will you permit us to say that Western traditions have developed a technology like a very robust strong moving fellow with diverse communication media and earth moving tools, but he is short-sighted. Classical India wisdom can give our fellow the millennia of long range perspectives that he needs to apply his muscle and fingers. Hence, NIOS’s essential contribution is bridging the gap between East and West, between C. G. Jung and the Bhagavata. Back in the weiner, Mumbay to Melbourne. We must offer our respects for such an old man, 70-years old, Hanumatpresaka Swami, taking so much trouble to travel so much for these educational programs. On the other hand he loves it and thinks that if death is a certainty this is the best way to die and then be assured of at least as much as Socrates declares in the Phaedo, we shall go to live forever with the gods. The programs in Australia were almost all internal ISKCON programs but this does not mean that they will not reach the outside cultural and educational communities. ISKCON in Australia has very successful programs with the larger world. In general, our observation is that culture in Australia is best spread with a basis in cuisine and music followed by erudite palaver, a practical, prosperous people. Kolkatta, Imphal, back Delhi, back to Houston. Swami resided in the ISKCON Kolkata Temple which is giving all facilities to help NIOS’s programs and worked with Dr. Samaresh Bandyopadhyay on forthcoming publications. Dr. Bandyopadhyay has been one of the two or three principal columns in the NIOS’s work. He is Chairman of NIOS’s Advisory Board and his impressive biography is available on the NIOS web site. With the Professor and ISKCON, H.P. Swami finished the Advertising Brochure that its agent in Navi Mumbai, Goloka Education, will distribute to promote sales of its many publications, and the formatting of the Institutes next major publication, Siksadarsa, Education in Ancient India and Man-making in Modern Times. With Professor review of the Institute’s journal, Solaris, now in production for its third annual edition was also executed. 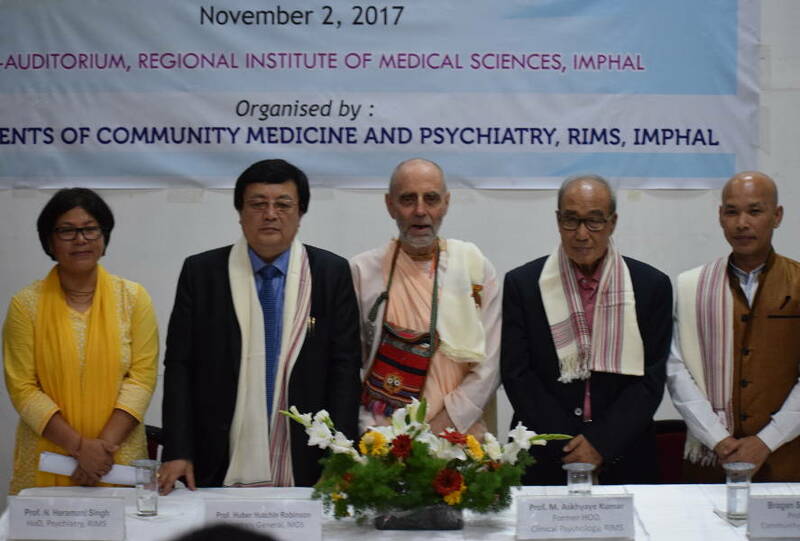 Regional Institute of Medical Sciences (RIMS), Imphal: (Left to Right) Dr. Sarada Ningthoujam, Professor, Department of Physiology, RIMS; Dr. N. Heramani Singh, Professor and Head, Department of Psychiatry, RIMS; H.H. Hanumatpresaka Swami, Scholar, NIOS; Prof. M. Akshaye Kumar, Former Head, Department of Clinical Psychology, RIMS; Dr. Brogen Akoijam, Professor and Head, Department of Community Medicine, RIMS. Three quick nights in Imphal, Manipur capped the India visits. Manipur is a state where Tagore declared the most ancient forms of India dance and culture are still intact. To a full auditorium of Psychologists, Psychiatrists, medical students a Seminar on Science, Psyche and Spiritual Health was presented. Manipur is a place with very, very, deep current esoteric traditions of introspection and psychic health that may for one of the most essential of all of our NIOS’s efforts. The host Regional Institute of Medical Sciences wants to develop more programs with international impact in the future. The final travel push from the front gate of ISKCON Kolkata to ISKCON Houston was 45-hours! This entailed a 12-hour working stopover in Delhi to drop off and receive literature, monies and plan a proposed Key-note Address for the forthcoming symposium with O. P. Jindal University on Administration and Spirituality and Mysticism in a Global Age. Participants will be joining from over 40-countries. Arriving back in Houston, Swami, Prof. H. H. Robinson, had no more gas in the tank. Of course, there was fever and exhaustion, but a monk following the classical Vedic life may be exhausted in mind and body but energized in spirit and intellect. Careful introspection can insure that this is the situation and no deep damage is being done. As scheduled, the instrument has recovered its strength and the Institute is working steadily to profit from the resources generated by the tour, and the next tour is being planned for Latin America, February to May 2018. For all your questions and contributions contact H. P. Swami (Prof. H. H. Robinson) through the NIOS Corresponding Secretary mentioned on the About Us page.